Be sure you choose the best ashwagandha supplement, using our results and ratings! Ashwagandha may help reduce anxiety, improve physical and cognitive performance, and have other benefits according to preliminary studies -- but our tests revealed a good ashwagandha supplement is hard to find! Only 56% of the ashwagandha supplements we selected for review passed all of our tests of quality. 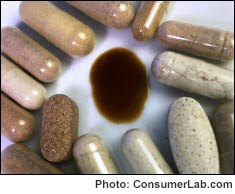 And even some of those that contained high-quality ashwagandha provided only a small dose. Our tests were based on amounts of withanolides -- key compounds that naturally occur in ashwagandha and are associated with its effects. In fact, amounts of withanolides in a suggested daily serving ranged from just 0.57 mg to as much as 95.3 mg! Fortunately, we also identified several products that passed all of our tests of quality and provides doses of withanolides consistent with efficacy in clinical studies. Among these, we selected as our Top Pick an ashwagandha supplement that offers superior quality and strength at relatively low cost.